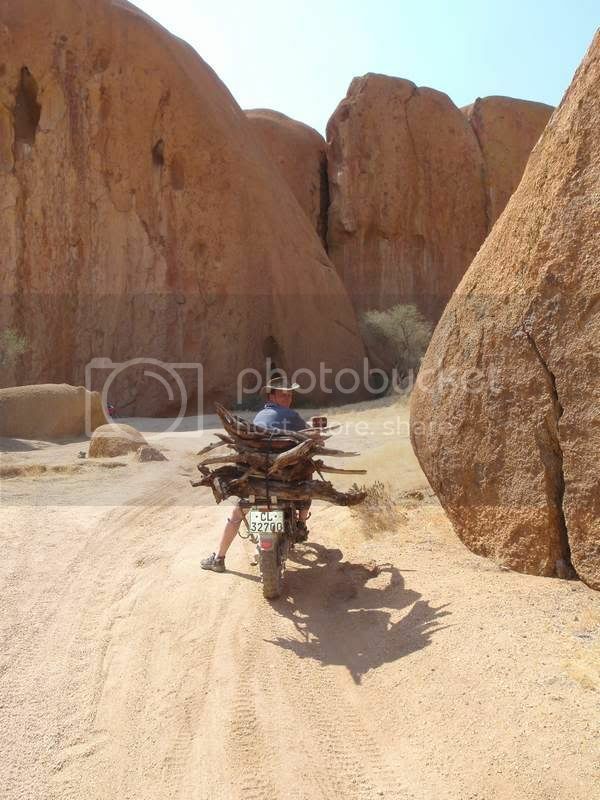 Jinne boet, there still just is nothing like Kaokoland and Damaraland. I see one picture and I'm right there, I can smell it, I can hear the silence, I am so fkn homesick I can't help myself. And it's not even my home. Thank you for posting, it's like being there. One thing I notice; you guys are pretty competent riding offroad, and you have someone with you that have been there before. That makes all the difference. If you doubt your skills, think hard before attempting something like this. Great stuff; respect to you guys that rode up and down van Zyl's with loaded bikes. The worst part is actually before van Zyl's (Ovivero area). Brings back good memories of a 4x4 trip and a few days at Epupa and Otjinhungwa on the Cunene. The corrugated road to Puros through the desert (we didn't take Rooidrom Pass) took forever in a 4x4 and is known as the worst road in the world! The pity is that, due to private concessions only being able to access the Skeleton Coast National Park in northern Namibia, and the lack of fuel on a bike, that you can't explore the Hartmans Valley, the dunes to the sea and Cunene River mouth (although I'm told it's a bleak and windy spot). Looking forward to tne next part! 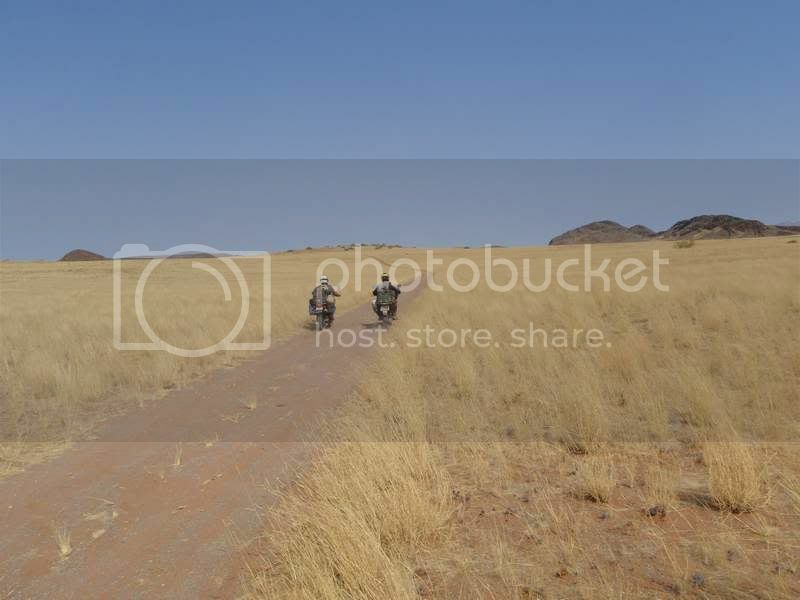 What followed was the most horrendus corrugated 96 km to Sesfontein. Fortunately, contradictory to all reports, there was petrol at Sesfontein. I was on reserve, and having had to stop a few kays before town to tilt my bike so the petrol could run to the lowest petrol tap on my Acerbis, were running on fumes. Danie made it with a liter to spare , and Gideon ran out of petrol about a 100m from the petrol station. Filling up never felt so good, and we left for Palmwag. After the Marienfluss, the road to Ongongo felt overpopulated, so we opted for the Hoanib river trail. We managed to dodge this one, and once we made it to the safety of the opposite riverbank, proceeded to tune him, and also took some photographs. 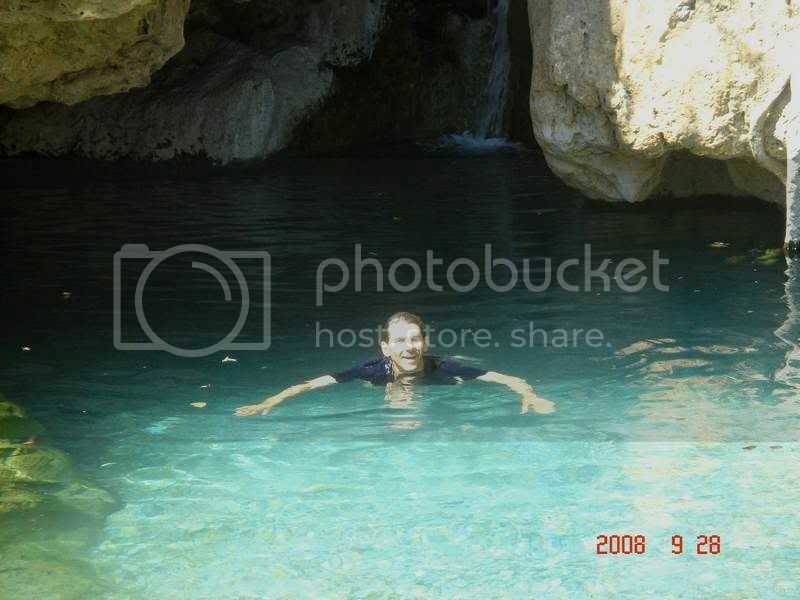 At Ongongo we had a quick dip. What worked well was to wet our clothes, and then get on the bike and rideâ?¦you would be dry within 30 minutes, but it worked wonders too keep us cool. From Ongongo, the route was pretty straight forward to Palmwag, where we filled up with fuel. 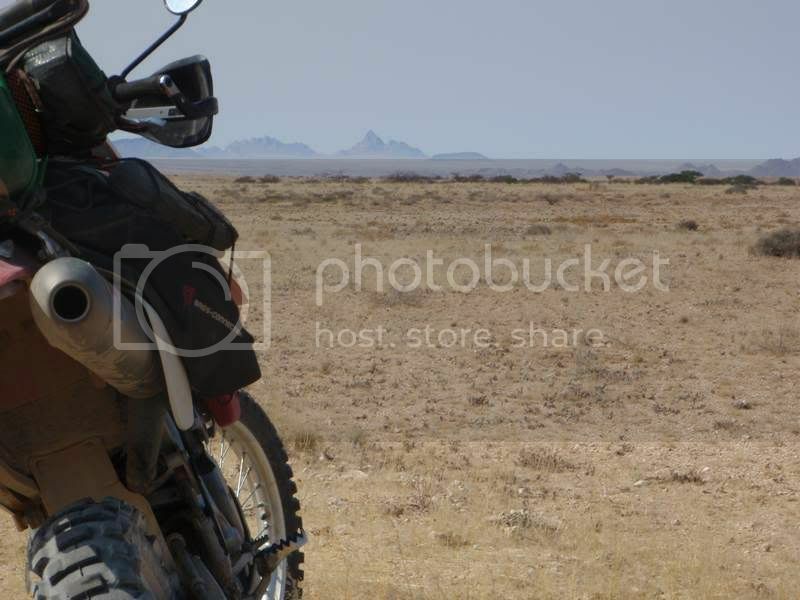 Going through the Vet gate saw us bailing through the Torra conservancy, and finding a suitable spot after about 20 km, we bushcamped as there was no other options available. Braaing some wors we bought at the shop at Palmwag, we set about planning the route for the following two days. 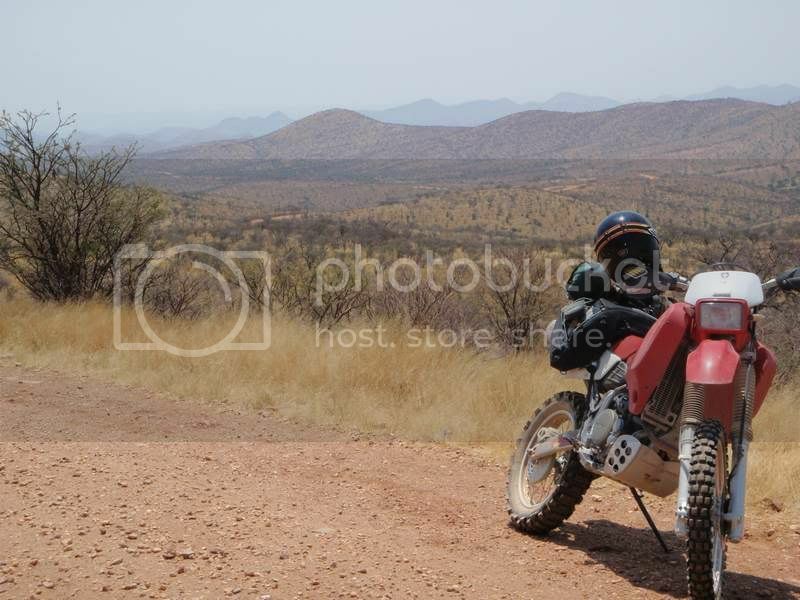 Having grown accustomed to the wide open spaces, and having developed an appetite for the more off road type trails, we scrutinised the GPS Nuvi 200 for the best options, settling for a route via Twyfelfontein to Brandberg Wes, circumventing the Doros crater. A quick spin down the C43 got us to Twyfelfontein lodge, where we had refreshments whilst I charged my camara, courtesy of the lodge. 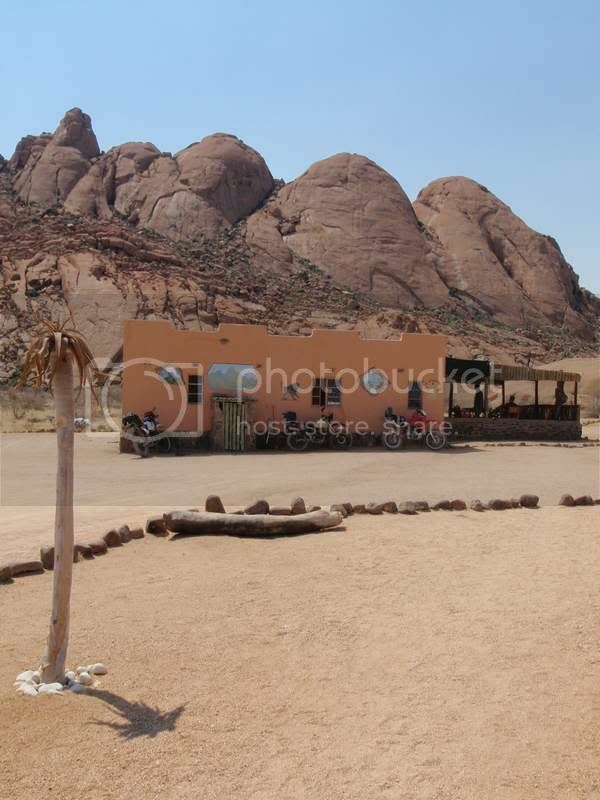 From Twyfelfontein, we tracked south, and then followed the Doros river in an easterly direction. 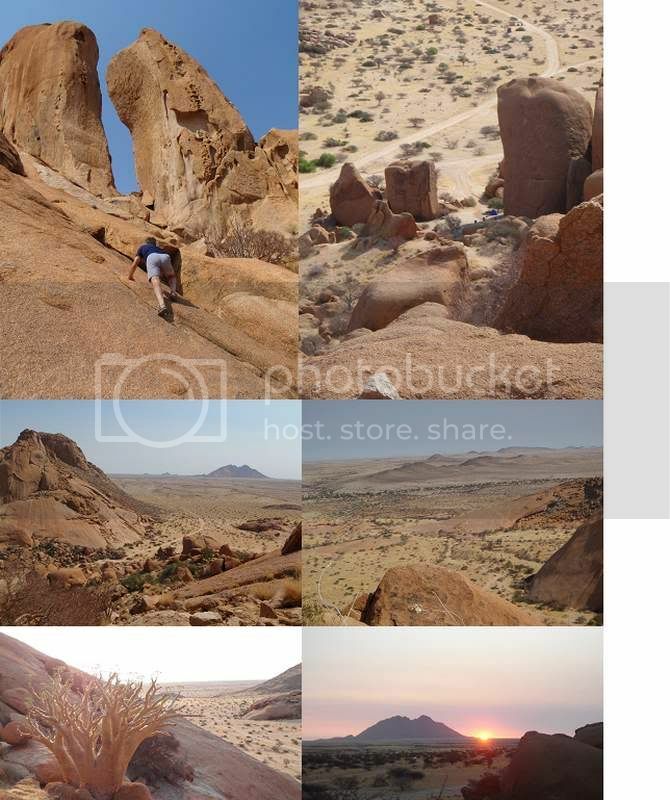 From the north of Doros crater we again tacked east, eventually following the Desolation Valley eco trail to the Rhino Ugab camp. At one stage we were lost, once again, and consulting with the GPS, we got a curt â? 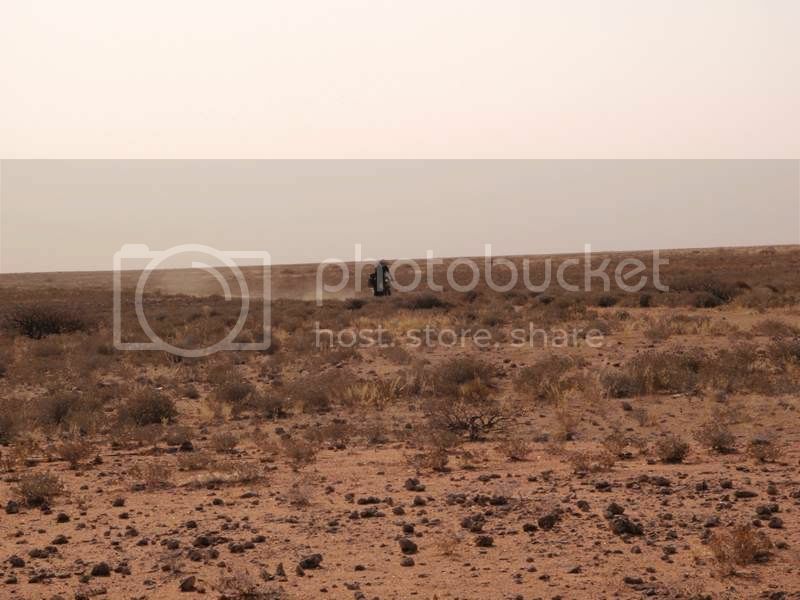 ?sorry, you are not on a trail, can not be routedâ?� message. 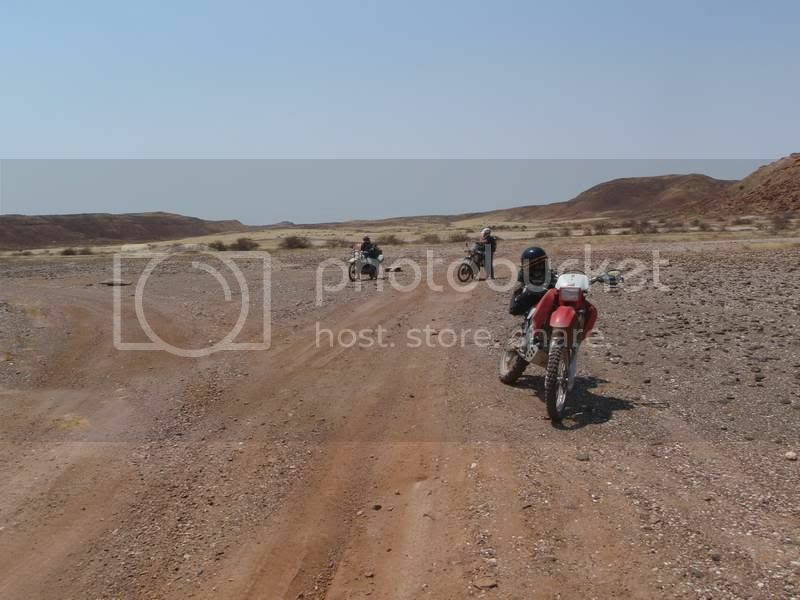 (We were not only on a trail, but at a cross roads) What could we do but to follow the tracks down the Ugab river, clueless and hot as hell. 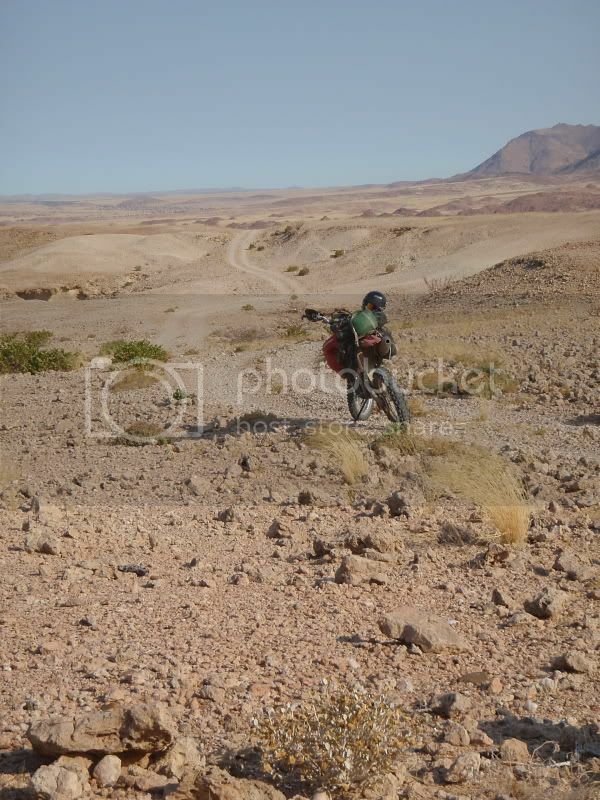 The riding was great, some riverbed, then following a twee spoor across some Kalahari type red sand dunes. Of all the sand riding we did, this red sand business was the most difficult for me, my arms were pumped after about 5 km, and we had to do about 40 km. We followed the Ugab, skirting Brandberg to the South and exiting near the White Lady. Not being the deeply cultural types, we skipped the lady, and made for Uis, where we caught the local Spar open, â?¦fresh provisions for the first time in more than a week! We splurged, Lamb chops, tinned peaches, you name it. Filling up with petrol, we followed the D1930 south, and at the Omaruru river bushcamped, with the idea of following the Omaruru and then entering the Grosse Spitzkuppe from the West. Hey, I type with two fingers.. 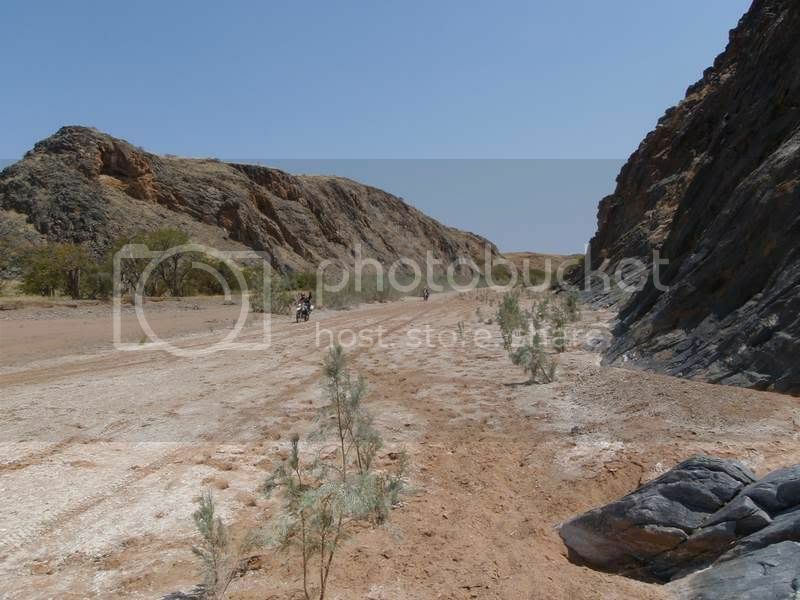 I agree..even though we were there about 20 yrs ago, and the place has changed a lot, some of the stuff like the heat, lack of water, bushcamping, remoteness was the same and not a surprise that we had to deal with on top of the riding. In terms of competent off road riders, riding with someone like Gideon and Danie, even though they said nothing,is a huge boost. 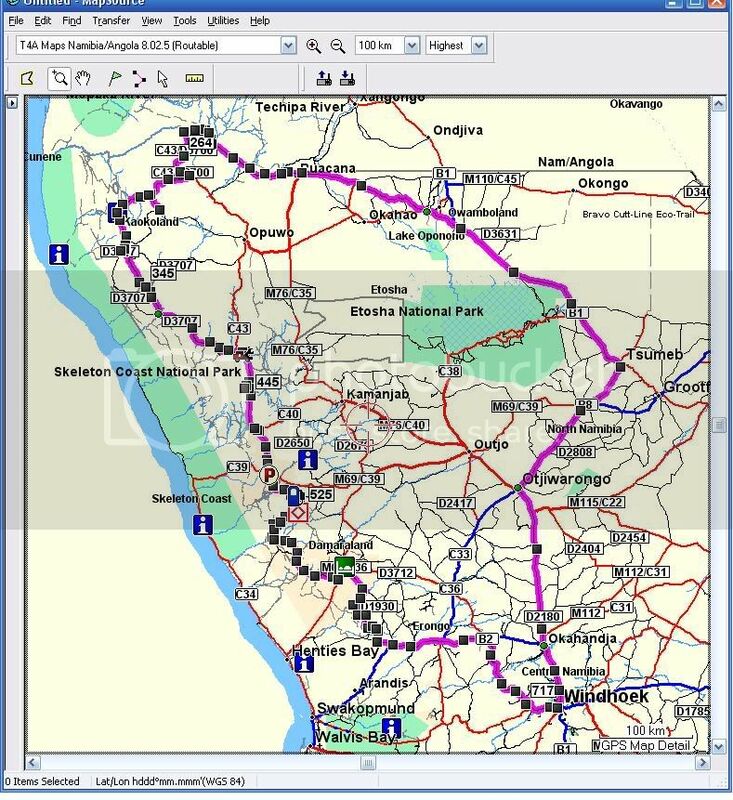 .... and the lack of fuel on a bike, that you can't explore the Hartmans Valley, the dunes to the sea and Cunene River mouth (although I'm told it's a bleak and windy spot). Oi, sitting on top of Van Zyls, looking in that direction...wanted to go there big time. Donner, ekt geweet ek moes eerder n XR koop..
Keep the report comming,great stuff,cool pics. After a liesurely breakfast, we packed up and got on with the business of doing the 100 odd kays to Spitskoppe, our shortest daily distance for the tour. It is quite amazing to see Spitzkuppe rising from the barren plains, this view was taken from about 60 km away. Arriving at Spitzkuppe, we confirmed hot showers (we needed to clean up for the long way home the next day), booked in and made camp for our last night. We then visited the local watering hole. Afterwards, going for our confirmed hot showers, we were bluntly told â? ?why hotâ?¦the sun is shining outside, you do not need hot waterâ?�, and not being able to argue with such logic, we had a v-e-r-y refreshing shower. We got some wood for our last campfire, Gideon doing his Farmer Brown impersonation. 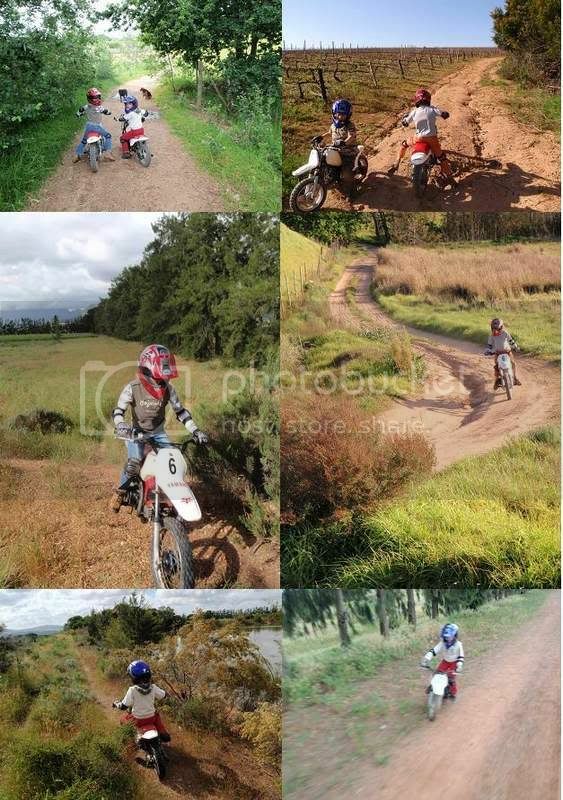 As we had the whole day (not riding, damn) me and Danie went exploring by foot. Spitzkuppe is an amazing place, and although I had no climbing gear, I still managed a few scambles. Following is a bit of the flaura, views and countryside, with our campsit thrown in for good measure. Clockwise, from top left, the koppie behind our camp, our camp with the blue tent visible, the plains towards Henties, our last sunset, tree and Klein Spitzkuppe. It was during this conversation that one of the ironies of the trip came upâ?¦Gideon mentioned that he was going to put a roofrack on his Cruiser, with a ladder to facilitate getting up and down, when Danie interjected with a no, no, it wonâ? ?t doâ?¦.at our age getting on a roof in the middle of nowhere is an accident waiting to happen. This after twelve days of bailing down riverbeds helter skelter, over rocks etc., buying farms in generalâ?¦.go figure. Spitzkuppe to Windhoek and home. Amazing how riding fit one gets, over a short period, if you ride everyday. â? 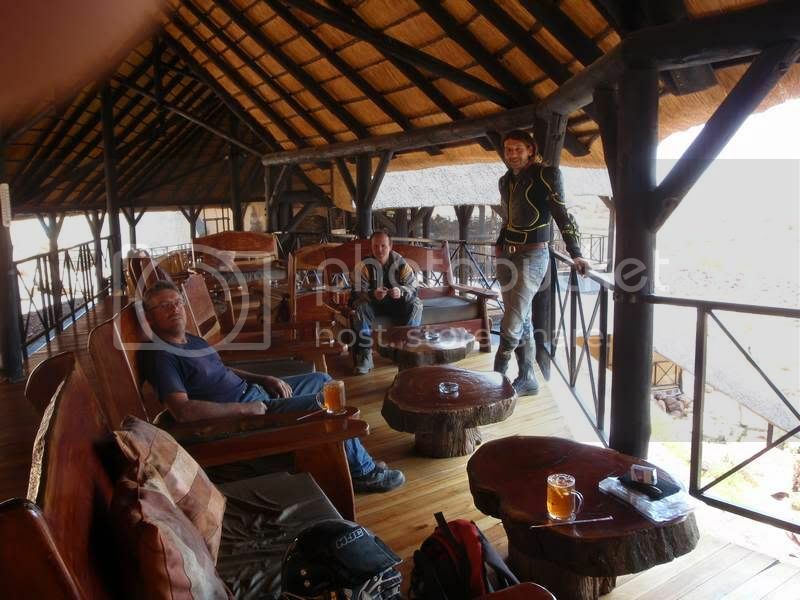 ?Klappingâ?� the 320 odd keys to Windhoek was a non event in terms of numbbumness. In Windhoek, after packing the Bakkie, we hit the B1 home. Arriving in Stellenbosch, we had to adjust to the rain and everything being as green as an emerald in the morning sun. Dropping Danie and Gideon, I headed home, kind of weird after being away so long. That night I had a great meal, a soft bed and a warm body next to meâ?¦morning came to soon and I saddled up for the last leg. To date, even though I have been using adjectives with gay abandon, I have refrained from asking "Is this not what riding is about?" Thanx for sharing the experience!! Registration papers of all vehicles. Staal druppels - stops bleeding instantly. Keep in mind that I have an XR, it does not use fuses etc. With the following I can practically strip the bike, set valves and everything. Also share and do not duplicate amongst group. Great stuff Beserker! I was working just west of Klein Spitzkoppe a few weeks ago and saw bike tracks coming up from the Omaruru river towards Sptizkoppe. Must have been you guys then. What a read and what a trip. Thanks for taking he time and putting all together for us to see. Thanks for the route map and postscirpt, very helpfull. 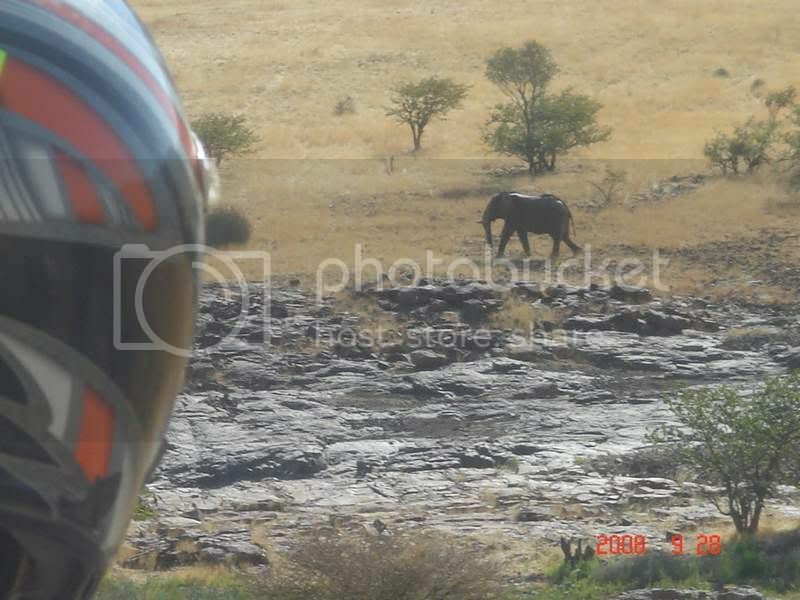 I'm busy planning a trip for 2010, your western route through Namibia is very similar to what I have in mind. Awsome awsome ,bloody great trip, after seeing that there is now a longing/calling inside my chest.Strange so many of us that spent time there long to go back. Enjoyed this very much! Well done on the trip and report! Beserker, is that Gideon Joubert who joined you guys?